Under the patronage of H.H. Sheikh "Hamdan Bin Rashid Al-Maktoum" Deputy Ruler of Dubai, UAE Minister of Finance and President of Dubai Health Authority, H.E. Dr. "Hanif Hassan", UAE Minister of Health, Chairman-Board of Directors at Sheikh Hamdan Bin Rashid Award for Medical Sciences, will inaugurate in Saturday the "3rd Pan Arab Human Genetics Conference", that is organized by the "Center for Arab Genomic Studies", a division of "Sheikh Hamdan Bin Rashid Al-Maktoum Award for Medical Sciences", at "Al Bustan Rotana Hotel" in Dubai. Dr. Najib Al-Khaja, President of the conference and Secretary General of Sheikh Hamdan Award for Medical Sciences said: "The wide vision of His Highness Sheikh Hamdan Bin Rashid Al Maktoum, patron of the award, reviews the importance of supporting research in human genetics and bridging gaps among Arab geneticists in order to coordinate their efforts and reduce the spread of genetic diseases in the Arab world. 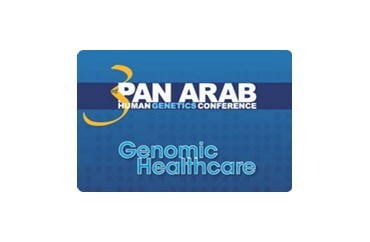 He added that the Pan Arab Human Genetics Conference is a unique event in the Arab countries as it achieved great success during the 2005/2006 and 2007/2008 rounds. It is also expected to achieve greater success this year. Dr. Al Khaja explained that the conference adopts international standards which enable it to be thoroughly put in the agendas of the most important conferences worldwide in the field of human genetic sciences. The main objective of the conference is to support scientific researches in the Arab region and at the same time reduce the spread of genetic disorders which threaten the security and stability of the Arab family. Tomorrow's agenda includes an interactive session entitled "open clinic session" where doctor speakers will review 7 rare genetic disorders or disorders with overlapping symptoms and ways used for their diagnosis on clinical or genetic levels. Additionally, a research study from Saudi Arabia will be displayed to review the discovery of a gene that causes severe mental retardation and its relationship to facial and skeletal genetic disorders, a rare genetic disorder from Tunisia, as well as a genetic skeletal disorder in a Pakistani consanguineous family. Dr. Al Khaja added that an important symposium entitled "The role of media in genetic literacy" will be held on the second day of the conference as part of the societal role of the "Center for Arab Genomic Studies" to raise awareness of the seriousness of genetic disorders in individual and social levels. The symposium hosts Dr. "Ali Singel" the presenter of "vitamin" on Dubai TV, Mr. "Jamal Al-Bah" chairman of "Arab Family Organization", and Dr. "Hanan Hamami" professor of Human Genetics Department of Medical Genetics and Development at Geneva University Hospital, Switzerland. It will be also moderated by Dr. "Tarek Al-Abyad", supervisor and presenter of the medical bulletin show in Al-Jazeera TV and reviewed in Arabic language.